It’s not a very inspiring name, but I fell in love with this Bertha Gray Hayes pattern. To me, it looks a little like Mickey Mouse on a slant. The ears and the asymmetry take me to a happy place. 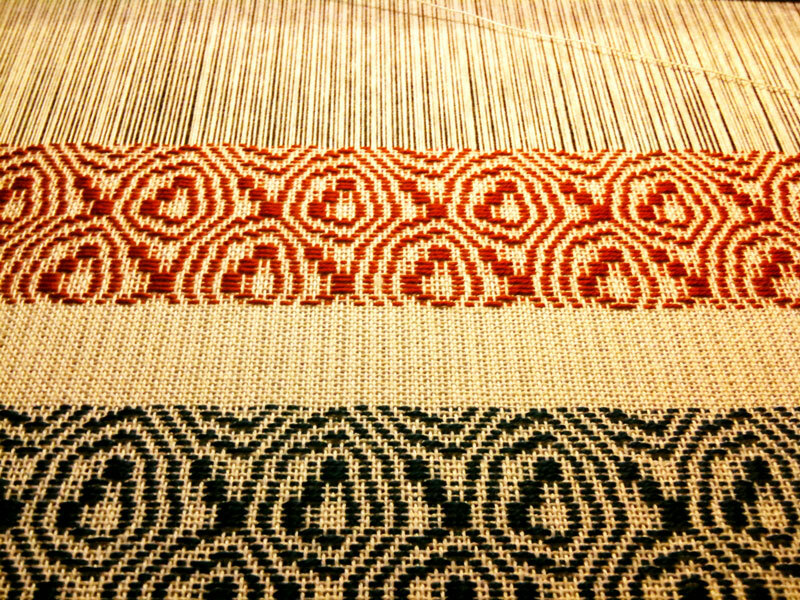 The draft came from Weaving Designs by Bertha Gray Hayes Miniature Overshot Patterns (page 179). If you haven’t seen Bertha Gray Hayes’ overshot designs, you are in for a treat. The collection contains over 90 original designs, all drafted by hand and woven on a small Structo Loom on 4 harnesses. I have really been enjoying myself with this draft. The draft has a repeat of 38 threads and 38 treadle sequences. I’m glad I wound on extra warp because it took me a little bit to get the sett right (I went to 16 epi instead of 18), correct a mistake in my tie up, and then find the rhythm of the treadling sequence. Now that those are fixed, it’s been a joy to watch the fabric grow with each person’s yarn. What you see above are the tail end of Teddie’s square (teal) and Ruth’s square (cinnamon) building. As for Ruth’s question, my yarn is a handspun Blue Faced Leicester single that I dyed teal.